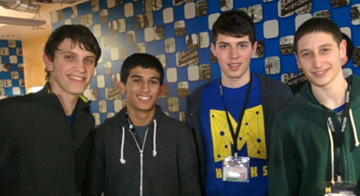 Did you know there's a "hackathon league" for high school students? A few years ago, only a few people knew what a "hackathons" was. But now, thousands of college students now participate in hackathons around the world. There's even a hacking league called Major League Hacking, which basically runs the spring and fall hacking seasons each year. So just what is a hackathon, and why should you care? Hackathons are weekend long programming competitions where students get together to show off their coding skills. Students from hundreds of universities team up to build things like websites, applications, hardware hacks, and at the end of the weekend they show them off to the world. Over the years, these events have gotten bigger and bigger, which is why there is now a hackathon league. You're sure to hear more about hackathons in the years ahead, and how they're becoming so popular with college students. But what about hackathons for high school students? Is there even such a thing? When the first High School Hackers meetup was held at PennApps last year, it brought together hundreds of like-minded teenagers for the first time. Over the course a year, high school hackers made their mark, not only exhibiting hockey stick growth in their Facebook group, but also winning hackathons like MHacks. Today, we’re bringing High School hacking to the next level with the introduction of Minor League Hacking, a partnership with MLH that will focus on teenage hackers. Currently, Minor League Hacking will display high school hackathon events and college level hackathons that admit high schoolers. We plan to bring official Minor League Hacking events starting in 2015 along with hack showcases and much more. It's early days for Minor League Hacking, but we applaud the high school students who are working so hard to create the league, and bring the exciting world of hackathons to teenagers. Head on over to minorleaguehacking.com and check out the high school hackathons that are coming up near you. And let us know your thoughts in the comments section below. Would you think about going to a high school hackathon?